Many children and adults are affected by hay fever in the spring and summer months, when plants grow and bloom. Sneezing and itchy eyes can be a real problem, especially on days that are warm and dry. A lot of people who have allergies and asthma have more asthma attacks around this time of year too. 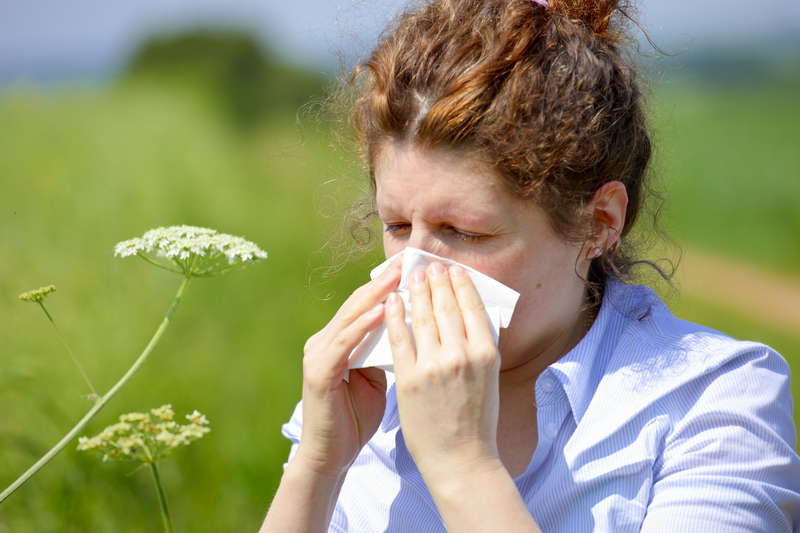 Hay fever is an allergic reaction to pollen in the air, affecting the upper airways. The symptoms it causes are called allergic rhinitis. People who have allergic rhinitis sneeze a lot and have a runny or stuffy nose. If their symptoms are more severe, they might also feel weak and tired. Sometimes people have watery and itchy eyes too, and their eyelids become swollen. The medical term for this is allergic rhinoconjunctivitis (allergic rhinitis combined with conjunctivitis). Other possible hay fever symptoms include itching and asthma-like symptoms such as coughing, wheezing, and shortness of breath. These symptoms only occur during the pollen season. They are usually much more noticeable than the symptoms of a dust mite allergy, but don't last the whole year. Allergy symptoms arise when your body overreacts to particular substances that are usually harmless, such as pollen. These substances (allergens) trigger a chain reaction in the immune system. First, antibodies to the allergen are made, and they bind to specific cells. If these cells come into contact with the allergen again, they are then able to release chemical substances, one of which is histamine. These substances then lead to allergic reactions such as sneezing or itchy eyes. Sometimes a higher risk of allergies runs in families. Environmental factors such as air pollution and cigarette smoke can make allergies more likely. Allergies are quite common nowadays. This may be partly due to higher standards of hygiene and the fact that some infections have become less common in childhood. As a result, our immune systems are often not as “well trained” as they might have been in the past. Hay fever affects about 1 out of 4 people in industrialized countries like Germany. It usually first arises before the age of 20. The allergic rhinitis symptoms may "move down" into the lungs and develop into allergic asthma after several years. Sometimes people who are allergic to pollen, for instance, become allergic to certain foods too after a while. This is known as cross-reactivity. Severe hay fever may increase the likelihood of developing other medical conditions such as sinusitis (inflammation of the sinuses). Hay fever makes the mucous membranes overly sensitive in a lot of people too. As a result, their nose also reacts more strongly to irritants like dry air in heated rooms or cigarette smoke. If you see a doctor, you will first be asked about your symptoms, your everyday life circumstances, and medical history. The doctor can then do a skin prick test to find out whether you are allergic to particular substances. This involves placing small drops of various potential allergens on the skin of your forearm, leaving enough space between them, and then pricking the surface of your skin where the allergens are, so the substances go into the skin. If your skin becomes red and swollen, like a big mosquito bite, it’s a sign that you’re allergic to that substance. You might also need a blood test or something known as a nasal provocation test. This is where the membranes lining the nose are exposed to extracts of the potential allergen using a nasal spray or drops. If the lining of your nose becomes swollen, you sneeze and your nose starts running, you are likely to have an allergy. It's nearly impossible to protect yourself from pollen, unless you travel to areas of the world where there is currently no pollen in the air. You can minimize the effects of pollen by keeping windows closed and washing your hair before going to bed. Local weather reports often provide information about pollen forecasts and current pollen counts. There are also non-drug alternatives such as saline (salt water) nasal sprays and nasal washes (nasal irrigation). Allergen-specific immunotherapy (also known as desensitization) can reduce your sensitivity to allergens over the long term. Like with vaccines, this treatment approach involves being exposed to small amounts of the substance by having it injected or placing it under your tongue. In allergen-specific immunotherapy, you are exposed to the allergen at regular intervals. The treatment takes about three years to complete.